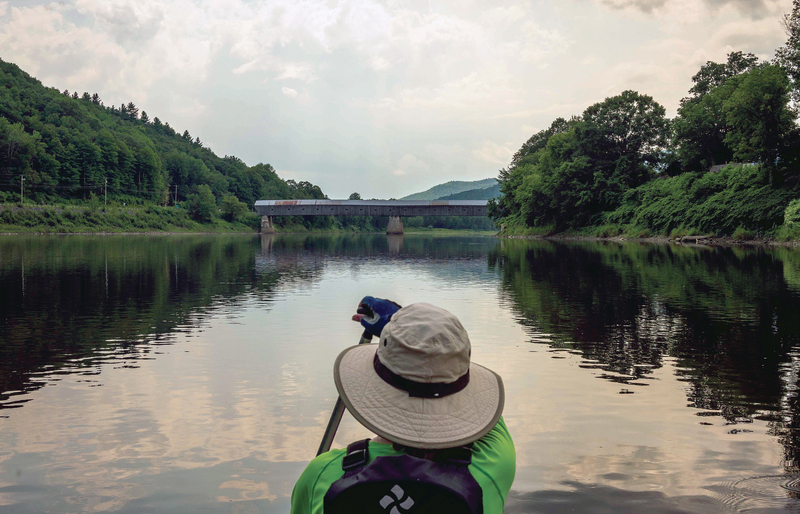 Deborah Walters paddlies Vermont’s Connecticut River. In 2014, Portland Magazine named Walters the Most Intriguing Person in Maine, and this blend of rationality and sally-forth resilience is one of the reasons: Although she’s a retired neuroscientist and professor who has presented her research throughout the world and mentored hundreds of students, she’s perhaps best known as the “kayaking grandma.” Search that phrase and the Internet will return story after story about her solo paddle to raise awareness and funds for Safe Passage, a nonprofit that supports the people who eke out a living in the Guatemala City garbage dump. In 2014, Walters – who had for years been kayaking solo in the Canadian Arctic – set out on a paddling trip that would take her more than 2,500 miles from Maine to Guatemala. The hours alone on the water would be broken up by stays with Rotarians and speaking engagements at which she would tell the story of Safe Passage. In the months that followed, the 63-year-old Walters, a member of the Rotary Club of Unity, Maine, USA, persevered through two hurricanes, close calls with unmapped sandbars, and raging surf that nearly rolled her kayak like a window shade. She had three encounters with the U.S. military and Department of Homeland Security – one at gunpoint – after accidental breaches of protected waterways. On the water, she was sometimes escorted by local paddlers. Walters was in her mid-50s, with two kids and four grandchildren (her husband of 32 years, Chris Percival, is an equally adventurous spirit who biked across the United States after retiring from his job as an electrical engineer), and she had recently retired from academia when two Rotarians she met at a Rotary institute suggested she join them on a trip to Guatemala. Chip Griffin and Marty Helman of the Rotary Club of Boothbay Harbor, Maine, were going there to take part in a service project with Safe Passage. It was 2004, and the trip altered the trajectory of Walters’ life. Two boys scavenge in Guatemala City’s huge landfill for anything they can use or sell. As she describes the sprawling, stinking ravine, Walters touches a necklace of bright beads made from recycled paper. It was handcrafted by women from the landfill community who have banded together through Safe Passage into a collective called Creamos, or We Create. It’s symbolic of the resourcefulness that emerges even from trash – and of Walters’ knack for appreciating it. On that first trip, Walters met Hanley Denning, a young Mainer who, after moving to Guatemala to study Spanish in 1997, sold all her belongings and used the proceeds to start Safe Passage. She knew the families of the landfill needed their children to earn an income, but she also knew those children needed an education. Many Guatemalans refer to the children themselves as basura, or “garbage,” and they are often unable to attend public schools. So Denning started a school at the dump where the children earned a bag of food for every month of perfect attendance. Eventually the organization began providing the students with lunch every day. Denning asked Walters to get involved, and she signed on to the Safe Passage board of directors in 2006. A year later, Denning, 36, was killed in a car accident in Guatemala. Many of the Safe Passage families feared the organization would fold with her death. Safe Passage gives children whose families live off the dump a chance at an education. Four years into her work with Safe Passage, Walters wanted to learn more about the rural indigenous communities from which many people in Guatemala City migrate. So she traveled to the country’s remote highlands with Sue Patterson, then a board member with ALDEA, a nonprofit that has worked with Mayan communities for five decades to enhance health, sanitation, and agriculture. Walters helped residents and Rotarians join forces to address problems: In the village of Chipastor, for instance, waterborne illnesses were a leading cause of death, and the task of collecting potable water occupied hours each day. After clubs in Walters’ District 7790 worked with District 5420 (Utah) to obtain a Rotary global grant for a water system, latrines, graywater filters, and sanitation training, she accompanied teams of Rotarians to Chipastor, where they worked with villagers to build the cement-block latrines. In 2015, the Maine and Utah Rotarians worked with the Rotary Club of Guatemala del Este on a second global grant to replicate this work in two other villages, and in a fourth, Walters helped expand a successful preschool program by working with Ripple Effect, a program of District 5550 (Manitoba, parts of Ontario and Saskatchewan) that matched funds raised by more than 50 clubs in District 7790. Success, Walters stresses, always hinges on local expertise and input. She points to an example of the first energy-efficient stoves introduced in rural communities. Created to reduce the injuries, respiratory irritants, and deforestation associated with traditional wood-burning stoves, these new models would have been extremely effective – if only they had been used. When asked why the design failed, local people explained that families traditionally gather around their stoves to eat and socialize. The design didn’t permit that. The residents helped design a revised model that includes an apron around a masonry stove – and that is now the centerpiece of most households. Walters went on the Maine radio program TideSmart Talk to discuss her trip. Back in Maine, Walters zooms down Muskrat Farm Road in her bug-spattered Prius sharing stories of the people she has met in Guatemala who have inspired her: a woman who learned to read and write in her 70s so she could help her grandchildren with their homework. A student who, when asked what he would like for his birthday, carefully pulled his chair close to Walters and whispered, “Underwear and socks. ” And a young woman who was abandoned as a baby, got pregnant in her teens, and was forced to surrender her children because of drug addiction. Determined to reunite her family, she studied for eight years while working in the dump, graduated from the sixth grade, and now lives with her children. Phenomenal under any conditions, this transformation occurred in the setting of extreme poverty. Some worried about her journey. The Safe Passage children, in particular, were concerned about her spending so many hours alone. In June 2014, while in the final stages of planning, Walters received a package containing Patito Amistoso, or Friendly Duckling, a palm-sized rubber duck the students had selected to join her. The duo departed from Maine on 11 July 2014, and Patito spent every mile in the chest pocket of Walters’ personal flotation device. He even had his own blog. One afternoon, Walters quietly lifted her paddle from the water as she glided into a bevy of swans. She held her breath and slowly reached for her camera, astounded at her luck – until realizing the birds were decoys used to repel geese. But actual wildlife also abounded, including something she took for a rock but turned out to be a manatee. When the 1,000-pound creature moved, it nearly startled Walters out of her boat. Between these adventures she taught virtual geography lessons to the Guatemalan students who were following her voyage online. So in September that year, Walters resumed paddling, determined to complete the leg from South Carolina to Florida. Finally, on 10 February 2016, Walters glided onto Higgs Beach in Key West. Her expedition had raised more than $425,000 from private donors, churches, corporations, Rotary clubs, and The Rotary Foundation. Walters (second from left) and her fellow Global Women of Action Razia Jan, Lucy Hobgood-Brown, Stella Dongo, and Hashrat A. Begum at the United Nations in 2015. Walters, who was honored as one of Rotary’s Global Women of Action in 2015, still volunteers with Safe Passage but no longer serves on its board because of term limits she herself instituted. The Safe Passage school has grown into an accredited, award-winning private school that also trains public schoolteachers. “I would be happy for my grandchildren to attend Safe Passage,” Walters says. More than 40 percent of Guatemalan children aged five and under experience malnutrition, but Safe Passage has eliminated that problem among its students. More than 100 Safe Passage students have graduated from high school. Parents and grandparents have learned to read and write, and some have started small businesses so that they no longer need to scavenge to support their families. An English program was driven by parents who knew that children from the garbage dump need as many advantages as possible, but traditional English as a Second Language (ESL) materials aren’t compatible with the world in which these students live. A sentence such as “I store the milk in my refrigerator” doesn’t make sense to someone whose only meal is the one provided at school. So Safe Passage developed its own curriculum, with funds from a global grant sponsored by the Rotary clubs of Weymouth, Mass., and Guatemala-Las Americas. “Sustainability is the same thing as doing ourselves out of a job. Our goal is for the organization to become Guatemalan-run and -funded, ” Walters says. “Breaking chronic cycles takes a comprehensive program that addresses all the issues tied to intergenerational poverty. And it’s imperative to partner with other nonprofits, governments, and private businesses.” Half the Safe Passage board members, including the president, are now Guatemalan.